Anyone up for a colorful cultural event? Check out Holi Festival! This was brought to my attention by Ian a couple of days ago and thought of sharing this to everyone! 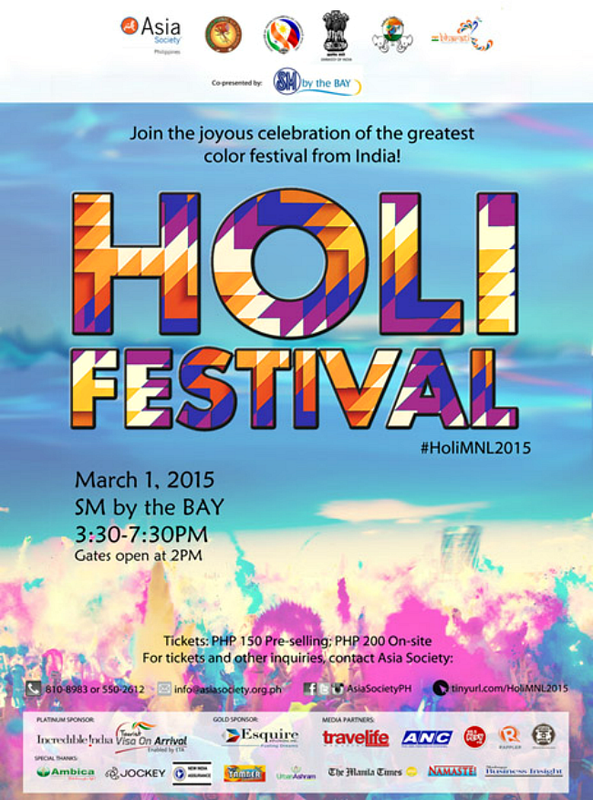 The biggest festival of colors from India is back in Manila in its 3rd year! Asia Society Philippines, together with the Embassy of India, Federation of Indian Chambers and Commerce, Sing India, Indian Ladies Club and Bharati present Holi Festival 2015 on March 1, 2015 at SM by the Bay. Holi is celebrated in the Indian month of Phalgun (March). Originally an agricultural festival, it ushers in the arrival of spring, the season of hope and joy. People imitate the colors of spring by throwing colored powder at each other and up in the air. The throwing of gulal up in the air and at each other symbolizes friendship, unity, and a sense of revelry. Holi goers in Manila can look forward to a lively show featuring Indian folk and Bollywood dances and live drummers and DJ from 3:30 PM - 7:30 PM. The gates will open at 2:00 PM, and early comers can peruse the booths selling Indian cuisine and merchandise or get henna tattoos. Both kids and adults can try out Rangoli making, a folk art in which patterns are created on the floor using colored rice, dry flour, colored sand or flower petals. Young kids can learn yoga through the creative storytelling session by the teachers of Kids Yoga Philippines (by Urban Ashram Manila). There are various legends behind the celebration of Holi. When Lord Krishna was young, he often complained to his mother, Yashoda, why he was dark and his beloved, Radha, was fair. Yashoda suggested that Krishna smear color on Radha, so she would look like him. Krishna heeded his mother’s advice, and thus introduced the festival of colors. Tickets are now available at a pre-selling price of PhP 150 and can be bought on site for PhP 200. Tickets include entrance and colored powder. For tickets, volunteer opportunities and other inquiries, please call (02) 550-2612, (02) 810-8983 or email info@asiasociety.org.ph.